​A yard full of golden dandelions in bloom can be a gorgeous sight. However, eventually, the flowers turn to white globes of exposed seeds that are often called "puffballs" that blow in the wind. Dandelions grow successfully because those puffballs disperse their seeds over long distances in any kind of breeze. Some dandelions don't need to wait for the wind, though. As dandelions turn to seed, children everywhere rush to pick them, so that they can close their eyes, make a wish, and blow the seeds into the air hoping their wishes will come true. No one knows for sure how or why people started making wishes on dandelions. These flowers have been around for thousands of years, and people have grown and used dandelions for much of that time. Every part of the dandelion has found a unique use. They are members of the sunflower family exist as about 100 different species around the world. Their flowers, leaves, and roots have been used for food, medicine, and even dye. Much more common than these practical uses, though, are the many folklore superstitions that have been attached to dandelions over the years. 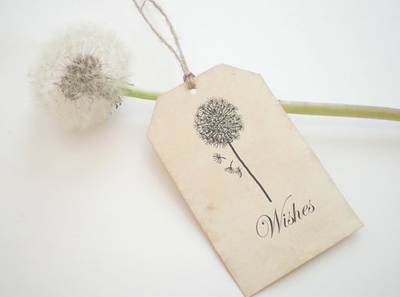 In addition to granting wishes, many people believe that dandelion seeds will carry your thoughts and dreams to loved ones when you blow them into the air. Others believe that dandelions may be able to tell you if you're loved. 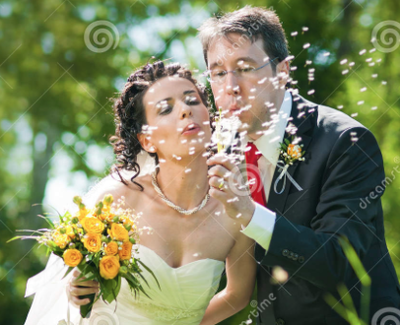 Legend has it that, if you can blow all the seeds off a dandelion with a single breath, then the person you love will love you back. If seeds remain, then the object of your affection may have reservations about their feelings toward you. Still others believe dandelions may help you tell the time or even the weather. For example, one superstition holds that the number of breaths it takes you to blow all the seeds off a dandelion equals the hour of the day. 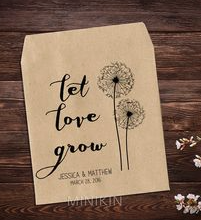 We suppose that could hold true if you're blowing on dandelions at two o'clock on a sunny afternoon and it only takes you two breaths to blow all the seeds away. Dandelions have likewise been called a "shepherd's clock" by some, since their flowers open shortly after first light and close again at dusk. Of course, a clever shepherd could also keep an eye on the Sun for similar information. Amateur meteorologists might use dandelions as an informal barometer to predict the weather. When dandelions have seeded, they will extend into a full ball in good weather. If rain is on the way, however, they will fold like an umbrella and remain tightly closed. How many of these superstitions hold any truth? You can be the judge. The one thing that is for sure, scientifically, is that blowing a dandelion's seeds into the air will have consequences. Where those seeds fall on fertile soil, there will likely be new dandelions in the future!